Few places in the world that are blessed with such spectacular scenery as the North Italian Lakes: olive groves, lush forests and a patchwork of countryside surround clear blue waters and soaring hillsides. Considered by many to be the jewel in the crown, Lake Garda is the largest lake in the country and marks the foothill of the Alps, which lead all the way across the border into Switzerland. Unsurprisingly, the region is great for outdoor pursuits including water sports, sailing, climbing, cycling and walking; check out some of the best spots below, or for more details search for Lake Garda holidays with Inghams. Lake Garda is a popular water sports destination and families and groups will particularly enjoy days out canyoning in the many pools and streams around the lake. Activities include jumps, slides and abseils down waterfalls, all under supervision from local guides. Depending on how confident you are, there are beginner’s options as well as more advanced routes. Windsurfing is big news around the northern resort of Riva. Enthusiasts come from all over Europe to experience the early morning winds from the mountains. First-timers may want to wait for the gentler afternoon breeze known as the ‘ora’ and take a lesson or two at their leisure. A more unusual variation is kite-surfing which has seen a surge in popularity recently – the best spots for this are located to the east of the lake around Brenzone and Malcesine. Back on dry land, there are still a host of activities to try. Lake Garda’s Alpine setting has made it a natural attraction for the mountaineering community, and there are many challenging and varied climbs to crack. The village of Arco in the north is best-known for its limestone crags which offer numerous climbing opportunities, and the cliffs at Marciaga are worth a trip as well. Mountain bikers will love exploring the cycling tracks which surround the lake; head south for easier options among small hills and farmland, or try the western routes Mount Tremalzo for breathtaking views that make the hard work worthwhile. Walkers will also find a wide choice of beautiful trails. Stroll from town to town, past vineyards and ancient monasteries, or seek out countless lakeside and mountain viewpoints along the shore. The palaces, churches and loggias of Salo make for an interesting culture trail through the town, while the summit of Monte Baldo can be reached by cable car, leaving you to enjoy the vistas as you start the downward hike. 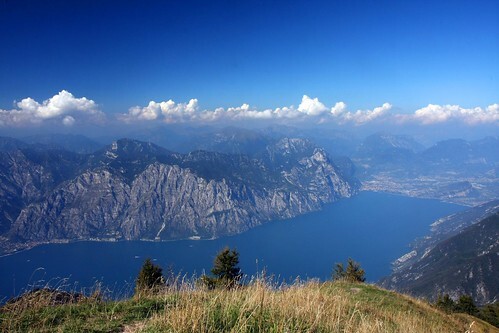 Torbole, at the foot of Mount Baldo, is also a picturesque starting point for the casual walker. Lake Garda has huge appeal for both outdoor enthusiasts and visitors who just want to access the stunning landscape and try their hand at a few activities. With charming lakeside resorts, fine cuisine and local wines to boot, this is a holiday experience which covers all the bases. Catriona Miller is a freelance writer who particularly enjoys the convenience of package holidays. While many like to get off the beaten track, Catriona prefers to take it easy and pay for the majority of her trips in advance. From soaking up the sun on tropical beaches to exploring hidden villages using organised day trips, she loves getting away from the UK weather!